That door is so tall, that the stack of the first mercury launch could probably be integrated vertically and fit through the door. I spy with my @blueorigin eye ... The letters are up over the entrance. Why? Atlas V and Delta IV did. Presumably that customer is going to get a healthy discount. The customers for the first flight of Ariane V, Delta III, Delta IVH, PSLV, Falcon I, Conestoga, N-1, Europa, Athena 1, Antares 130, SPARK, SS-520-4, Electron, FB-1, CZ-2A, CZ-3, CZ-2E/PKM, CZ-1D, CZ-3B, KT-1, KZ-1T, etc. were not so lucky. Blue Origin should accept some hubris and accept the fact that their first launch will have a high probability of failure and thus should not fly a customers payload. Surely that's down to the customer? They know it's a first launch. If they want to accept that risk, it's their choice. Agreed. As someone who's not really the biggest BO fan, this specific issue is a non-issue. The customer knows everything that was states up-thread. If the customer is fine with it, that's all that matters. Drove by the @blueorigin New Glenn factory at Cape Canaveral today. It seems to be nearly complete. There's also a good view of the facility as you walk up to visit the Space Shuttle Atlantis. I took a drive out to the plant last night. It looks amazing all lit up. Blue Origin has begun the process of moving into its massive rocket factory at Kennedy Space Center's Exploration Park, according to a NASA official's comments during a conference at Port Canaveral this week. But the factory's proximity to the pad and advances in automation mean teams won't necessarily need a launch control facility on Air Force property – officials expect to use one of the factory's upper-level spaces as a launch control center. Looks like these launch viewing chairs are there for a reason. Update on Blue Origin-related barge at Port Canaveral: Fire broke out while subcontractor was cutting weld used to secure new propellant tank. CCAFS crews responded. No injuries or damages. Occurred before Blue Origin took delivery of tank. Vice President Mike Pence visited Blue Origin’s new rocket factory near the Kennedy Space Center. Blue Origin’s flown New Shepard booster is on display in the lobby. 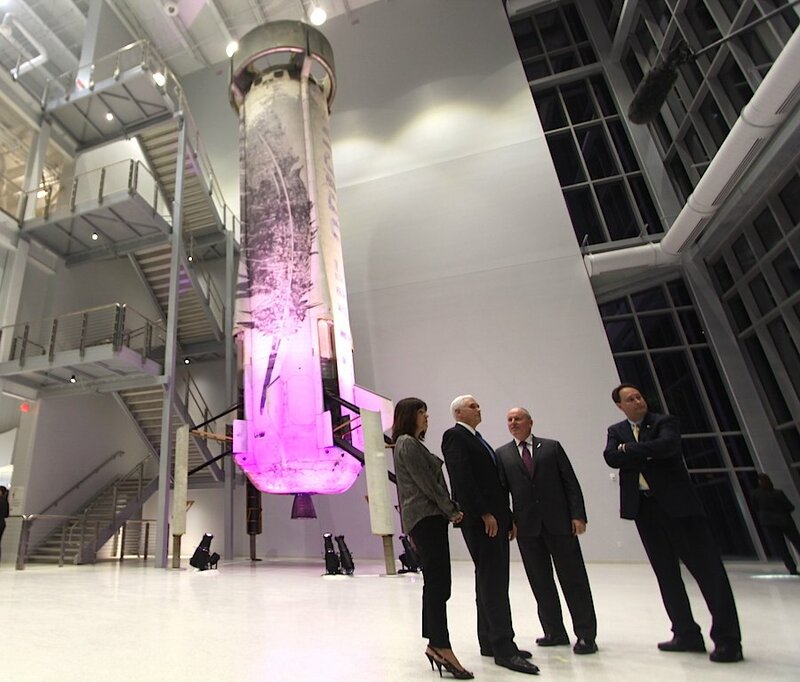 Honored @VP and @SecondLady toured our #NewGlenn rocket factory and new home for the historic #NewShepard booster. Some nice photos of the interior of the factory from NASA Kennedy's Flickr. Cable trays are filling up also positive. A little surprised the interior of the building is as empty as it is. Had hoped tooling, work benches, etc. would have stared to dress out the building by now. I understand they are two years from flight but would have expected some activity to have stared.